Last night I went to see Derren Brown’s Enigma show at the Alexandra Theater in Birmingham. Its not surprise that I am a huge fan of his work, hes a great manipulator and performer. 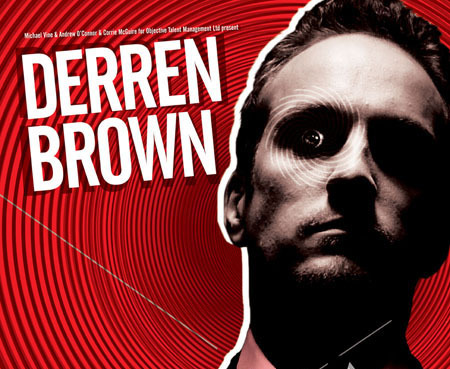 The show was excellent, I really enjoyed the control Derren has over his audience, and what I consider to be very subtle and highly effective linguistic skills. The show lasted almost 3 hours including a little break (I took the opportunity to do some card mentalism at the bar), and he really was on form throughout. Derren asked that no one speaks about the content of the show, so I will respect his wishes, but I really do recommend you go and see the show if you can, you will not be disappointed. The show has given me some other ideas and applications for my mentalism, as well as another possible SE approach, I look forward to developing these. I will say I only had one disappointment, and that was not getting to say hello to Derren after the show. Apparently he wasnt feeling to well, which is fair enough, shame the guy on the door was a complete arse (not part of Derren’s entourage). I am sure this will be released on DVD at some point as I believe it was filmed, and he has a new book coming out soon, so if your a fan keep on the look out.